The roof if the most expensive feature of your home. It is also arguably the most important. It protects the rest of the home from the elements, and if it fails to do its job your home could be in for some serious damage. When considering a home purchase, it’s critical to have the home inspected. While many home inspections include the roof, getting a separate inspection from a professional roofer is a good idea. But even before you get as far as an inspection, there are some areas you can check yourself. Knowing what to look for in a roof when buying a home can save you time and money in the long run. 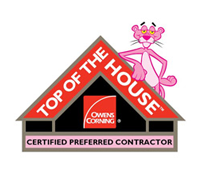 When you purchase a home, you are purchasing a large, expensive feature with it, the roof. A roof, unlike the rest of the home, usually has an upper limit to its life expectancy. In most cases, a home has to have its roof replaced several times over the life of the house. Think of your roof like a used car. There are many factors that go into the value of a used car. You will need to consider the overall age of the vehicle and its mileage. You will also look at how it has been maintained, whether it has had regular oil changes and other services. Of course, the type of vehicle is a huge factor. A used luxury vehicle is worth more than a used baseline compact sedan. The key to learning the value of the roof on a home is asking the right questions. You need to ask questions to find out basic things like the age of the roof, and other ongoing issues like maintenance and repair. Just like buying a used car, questions are a place to start, but you also want to inspect the vehicle inside and out. Finally, a responsible buyer will send a used car to a trusted mechanic for a professional inspection before making a final purchase. How old is this roof? What is the material of this roof? What is the warrantied life expectancy of this roof? When was the roof last inspected? When was it last repaired? What sort of damage was repaired? Has there been any maintenance (cleaning, minor repairs, gutter cleaning)? The answers to these questions will guide your inspection. All roofs have a life expectancy. The most substantial factor in life expectancy is the material of the roof. Some specialty materials, like slate, can last for centuries, but that is rare. More common roofing materials, like wood or asphalt shingles, have a significantly shorter lifespan. A shingle roof could last as few as 15 years. Of course, there are hundreds of types and brands of asphalt shingles alone. So while it is essential to know the age and the material, it is just as important to find out what the warrantied life of the roof is. That will give you a better idea of how long that specific brand of roofing is built to last. Typically, asphalt shingle roofs are built to last anywhere from 20 to 50 years. 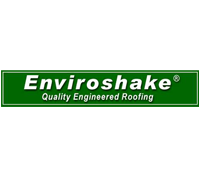 The two main types of asphalt shingle are three-tab shingle and architectural shingle. Three-tab shingle is the traditional, flat, regularly-shaped asphalt roofing material on most residential homes. If you are buying a newer home or one that has been upgraded, it is possible you will come across architectural shingle. Architectural shingle in thicker and varied in shape and size. It is meant to look more natural. Due to its thickness, it typically lasts longer than a three-tab shingle roof. With any type of roof, underlayment is also a significant factor in its longevity. Like roofing materials, there are many types and brands of underlayment. The underlayment is the layer under the shingles that rests directly on the decking and is the last defense against rain and moisture. In most cases, the underlayment will have a similar lifespan to the roof. But with some longer lasting roofing materials, the underlayment can be a weak point, with a shorter life than the shingles. The age, material, and warrantied lifespan of a roof can give you a general idea of how worn a roof is. For instance, a 20-year-old roof warrantied for 30 years should have 10 years left. But that’s in an ideal world. Maintenance can make a huge difference in the actual condition of a roof. Ask the homeowner or realtor about routine maintenance. Has the roof ever been professionally inspected, cleaned, or repaired? Did the homeowner do any repairs? If repairs have been done, what damage was being repaired? Something as simple as cleaning a roof a few times a year can have a huge impact. If leaves, branches, and other debris sit on a roof, they can trap moisture and cause rot. When gutters are left clogged, water may not adequately drain, also causing damage. So if a homeowner has kept up with cleaning and professional inspections, you are in luck. But if a roof has been neglected, you should be on the lookout for more serious damage. You can learn a lot just by standing on the street and looking up at the roof. First, look at the color of the roof. If there are streaks or dark spots, that may indicate mold or algae. While there is nothing wrong with a little mold on top of an older roof, lots of mold could indicate that the roof was not well maintained. While you’re checking the color, look for spots that are lighter or darker than the rest of the roof. Patches that don’t match the rest of the group can occur when the protective gravel coating on the asphalt shingles begins to wear off. The coating shields the shingle from UV damage caused by sunlight. If the coating wears off, the shingles will rapidly deteriorate, leading to potential leaks. While you’re still standing on the street, look for any missing or torn shingles. Also, check that the roof is relatively flat and even. Look out for curved, peaked, or curling shingles. These are all signs of shingle damage and can leave spaces for water and mold to penetrate the roof. When you come closer to the home, take a look at the gutters and downspouts. 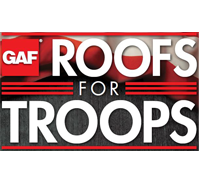 Check for any asphalt shingle granules that may have washed off the roof. Finding granules would be another sign that the roof is losing its protective coating. Also look at the gutters themselves to see if they are clogged. Clogged gutters can’t adequately drain water from the roof and can lead to damage in a heavy rain. There’s a lot you can see from the ground, but to do a full inspection, you will need to get on the roof. However, it is not recommended that you do it yourself, especially on a home that is not your own. Instead, talk to a professional roofer like Eagle Watch Roofing to arrange for a special roof inspection. We’ll use the proper safety gear to climb up onto the roof and do a detailed review. We look for damaged shingles and signs of leaks as well as checking the integrity of flashing and other features less visible from the ground. 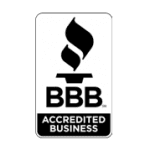 If you are thinking of purchasing a home in the Atlanta area, call your local Atlanta roofers, Eagle Watch Roofing, to set up an inspection before you go any further.